Q. 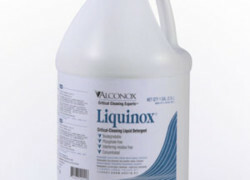 How do you determine optimum detergency for Liquinox detergent? A. As a general statement, optimum detergency for Liquinox® Critical Cleaning Liquid Detergent is reached at a 1-2% concentration (optimum defined as amount of soil removed per unit of detergent used). Maximum detergency is typically reached at a 2-3% concentration (maximum defined as the total amount of soil removed per area of substrate without regard to amount of detergent used). The maximum cleaning capacity is often achieved at 4 or even 6% (cleaning capacity is defined as the amount of total parts cleaned or combined amount of residue removed before you have to change out baths). If you are trying to clean lots of parts before you have to dump your bath, then using 2-3% may make sense. 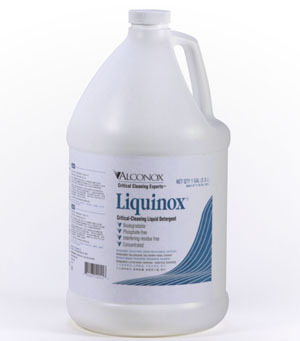 Typically you have to do extra rinsing to get the highest levels of cleaning when you use more than 2% concentrations of Liquinox. If the answer is “all of these,” then 2% is probably a reasonable compromise. Most Alconox, Inc. customers are doing very sensitive critical cleaning, so they rarely operate their baths at anywhere near full cleaning capacity. They use 1% solutions and dump the bath long before full use of cleaning capacity has been achieved because they are more worried about cross contamination from parts than they are worried about optimizing cleaning capacity. The basic detergency concepts discussed here can be applied across the rest of our detergent portfolio. Of course the specific concentrations will vary.